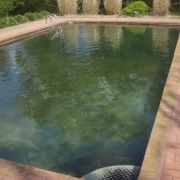 Basic Pool Chemistry | APCO Pools Specialties, Inc.
Green Pool: Never try to filter or balance a pool that is full of green algae or has a large quantity of leaves and debris. The leaves should be removed 1st then the algae must be killed and finally the water can be balanced. 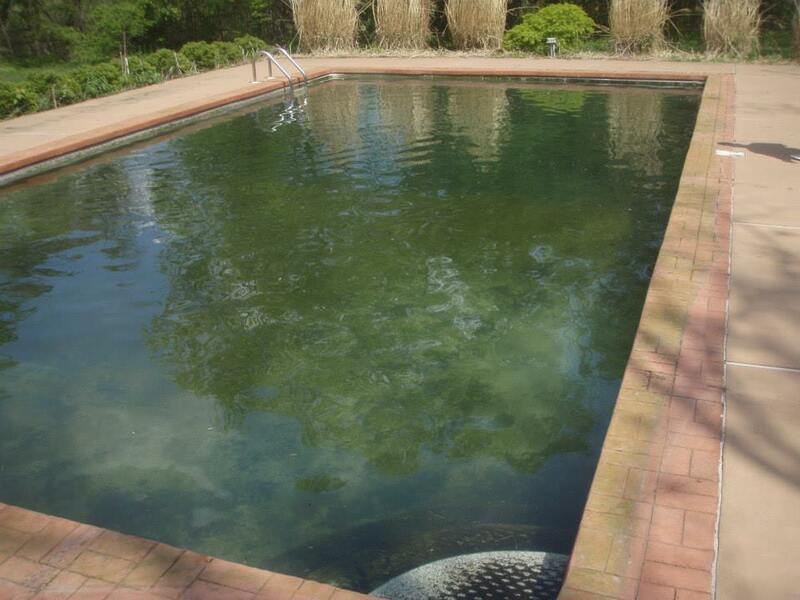 To kill the algae in this pool, you would need approximately 4-5 five gallon drums of liquid chlorine. 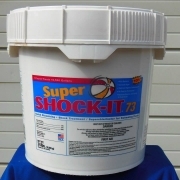 The ratio to make liquid chlorine is 5 -1lb bags of shock to a 5-gallon bucket but dissolved 1 bag at a time. 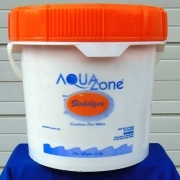 No chlorine residue should lay on the pool liner. 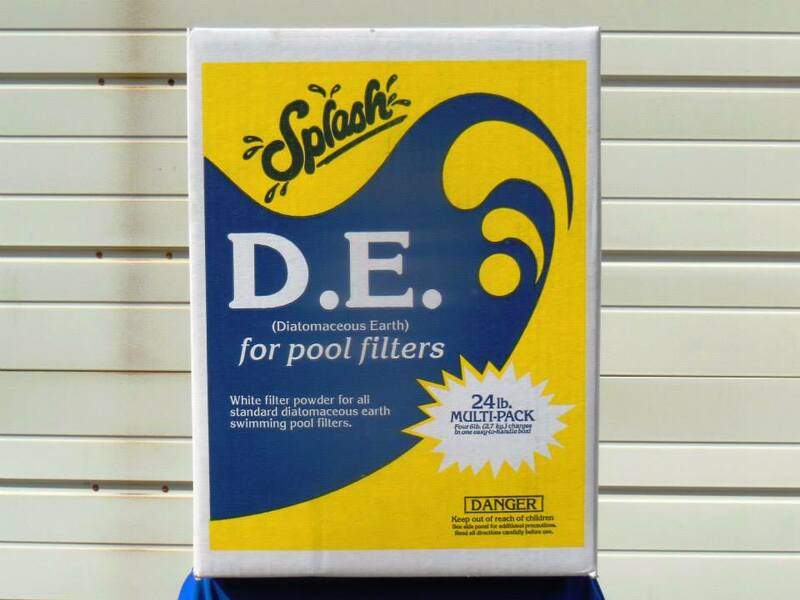 There must be enough chlorine installed into the pool to kill all of the algae. The system should be turned off or the multi-port valve should be on recirculate. Brush the walls with your pool brush. It should turn milky white. After the pool water turns milky white, than turn on filter. 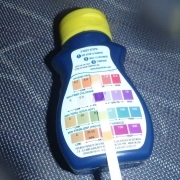 Pool Chemistry Test Strips: Testing levels for Chlorine, Chlorine Stabilizer, Alkalinity and pH. Directions - Dip the strip in pool water and remove. Wait 15 seconds and compare the strip to the color chart on the bottle. Each chemical has an ideal range. Pool Chemistry Test Strips Testing levels for Chlorine, Chlorine Stabilizer, Alkalinity and pH. Directions - Dip the strip in pool water and remove. Wait 15 seconds and compare the strip to the color chart on the bottle. Each chemical has an ideal range. For example: The chlorine level in this pool reads at 10 which is high. Chlorine Tablets: (Ideal Range 1.0-5.0) Kills bacteria and other unwanted micro-organisms. Recommended in automatic chlorine feeders. We do not recommend placing them in skimmer baskets or floaters as it may damage your liner or your plumbing lines. Shock: 24-1 lb. bags (Ideal Range 1.0-5.0) Shock the pool once a week with 1-2 bags. Always completely dissolve in a 5-gallon bucket stirring one bag at a time. 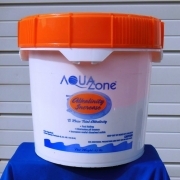 Do not allow any chlorine residue to lie on the liner. 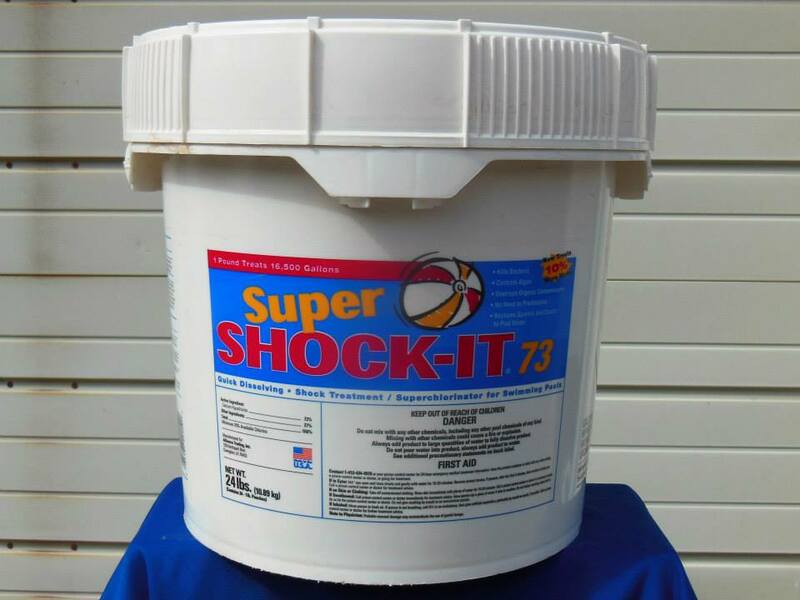 Never sprinkle chlorine shock directly over the pool water! Chlorine Stabilizer: (Ideal Range - 30-50) Stabilizes the water so that it can hold the chlorine longer. The safest and easiest way is to put the stabilizer in an old sock, tie it with a rubber band and place it in your skimmer. Should take 3-4 days to dissolve. 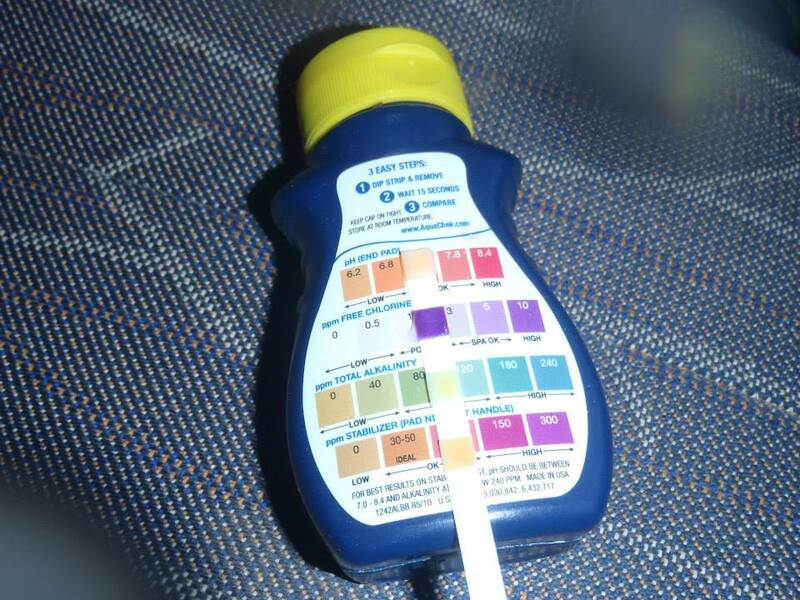 Based on a 20,000 gallon pool, you will need to go up to 10 pounds if the test strips read zero. 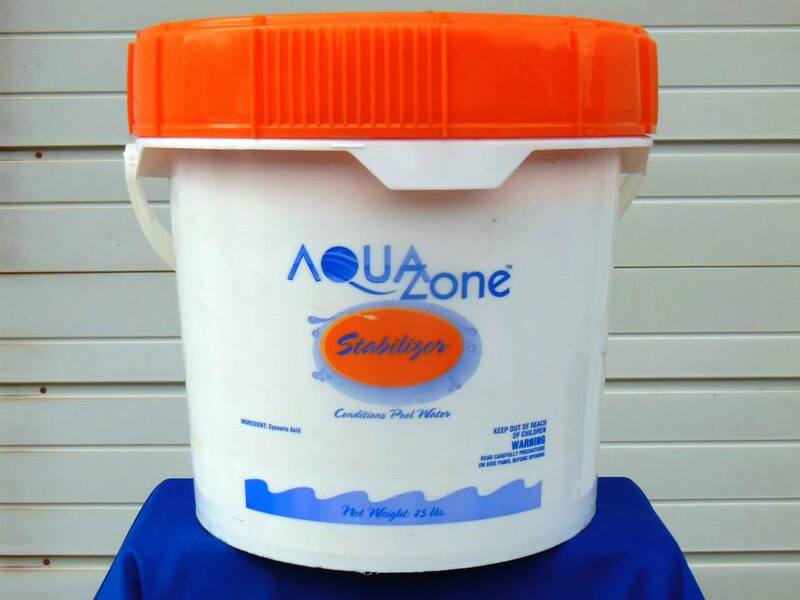 It is best to wait until the water is above 70 degrees to test for Chlorine Stabilizer. 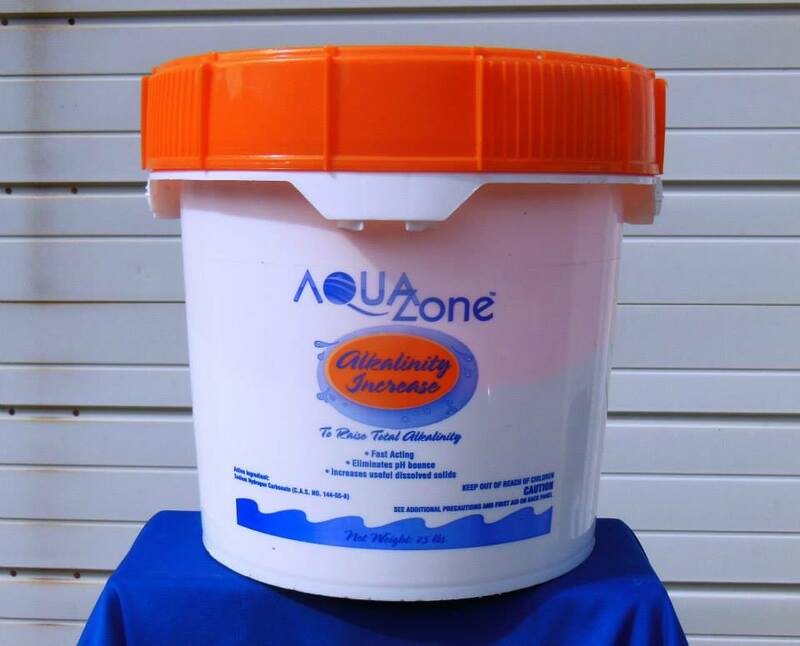 Alkalinity: (Ideal Range - 100-120) Alkalinity indicates the water's ability to resist changes in the pH reading. 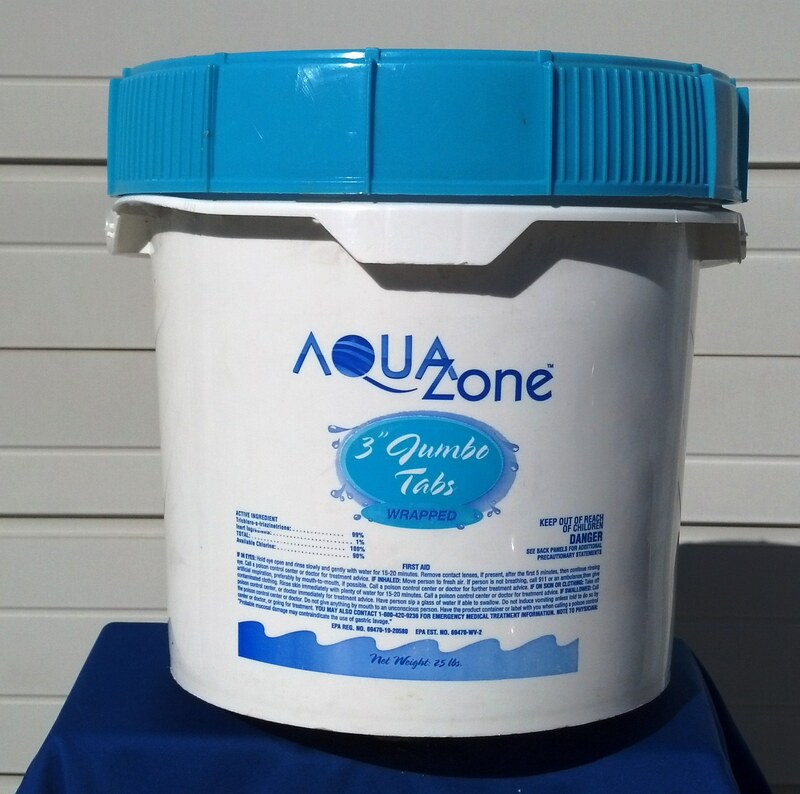 Broadcast Alkalinity powder evenly over the pool water. Only sprinkle in 1/2 of what is called for. Let it circulate a day, test the water, then add 1/2 again until the desired amount is reached. Based on a 20,000 gallon pool, you will need to go up to 29 pounds if the test strip reads zero. 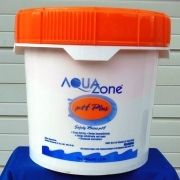 pH Plus: (Ideal Range - 7.2 - 7.8) pH indicates how corrosive the water is. This is the last chemical you adjust. 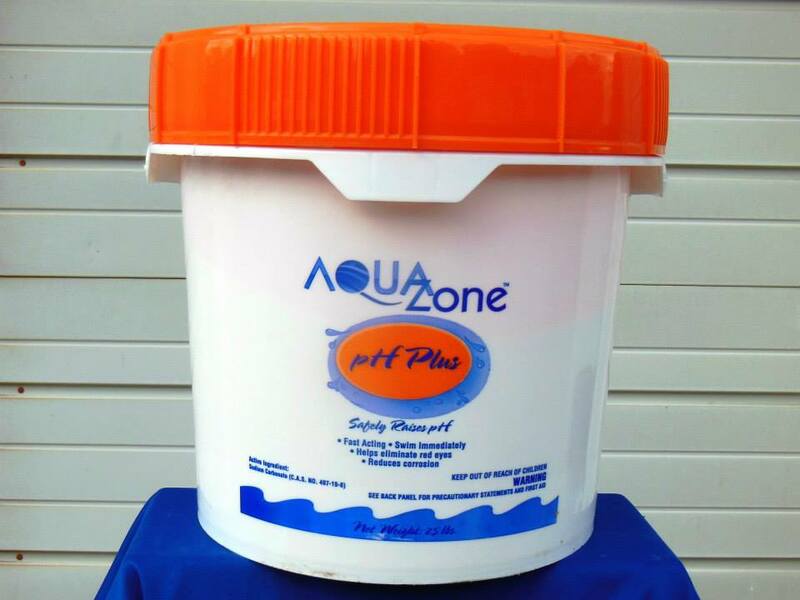 Never test for pH after shocking the pool, Alkalinity is incorrect, or after a heavy rain. Wait a day or two so that the water can circulate. Broadcast pH powder evenly over the pool water. Always add 1/2 of the required amount letting it fully dissolve, let it circulate a day, than repeat. For example: If the test strip reads 6.8, than you would need to add up to 3lbs. of pH +. DE Powder: Scoop DE Powder into skimmer bucket. Required amount is usually labeled on the side of your filter. Add DE powder during initial start-up or every time the filter is back-washed. DE filters are only as good as it back-washes. 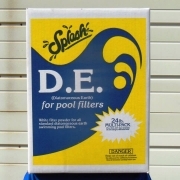 To have clean sparkling water, the filter is the most important component of your pool.